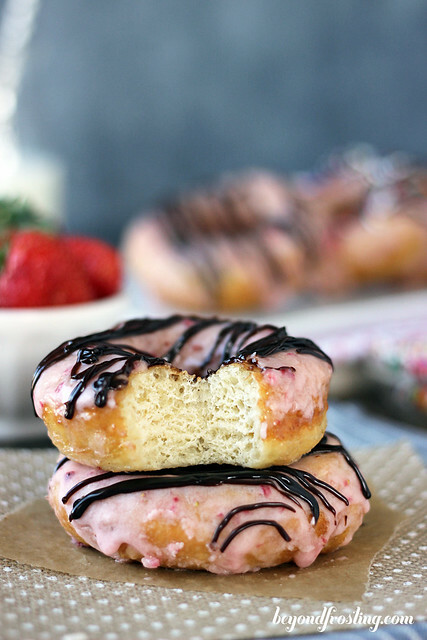 These donuts are smothered in a fresh strawberry glaze and then covered with chocolate ganache. 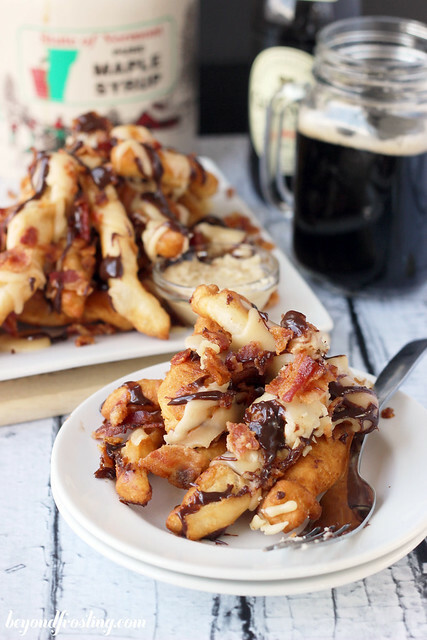 It’s time for another installment of my baking bucket list. In my first edition of the baking bucket list, I made these Maple Walnut Scones. This time it’s donuts! Traditional yeast donuts have haunted me forever and finally I made them! 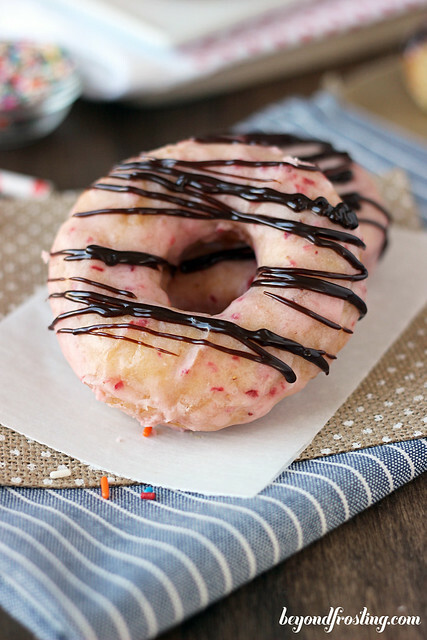 Since Valentine’s Day is coming up, I figured I would make Chocolate Covered Strawberry Donuts. 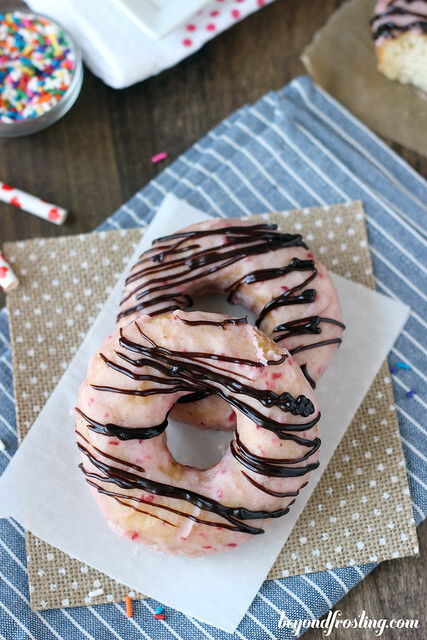 They begin with a fresh strawberry glaze and are then covered with chocolate ganache and some sprinkles; just for fun. The idea of a yeasted donut has always intimidated me. Something about relying on a rise just doesn’t scream “make me!” when I am pondering a recipe. But as I challenge myself more and more, working with yeast has become easier to me. 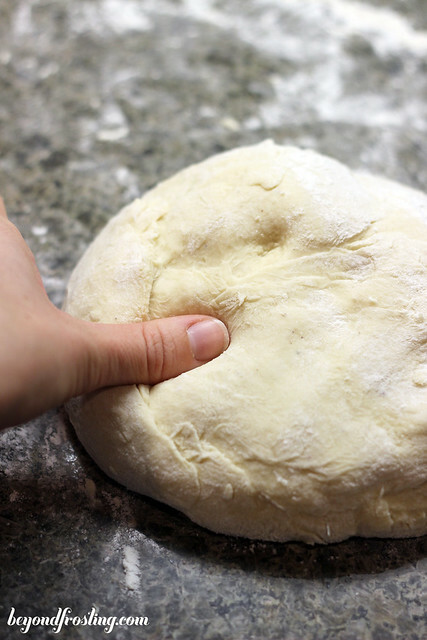 If you are able to stick your thumb in the dough, and it springs back at you, then you are done kneading it! 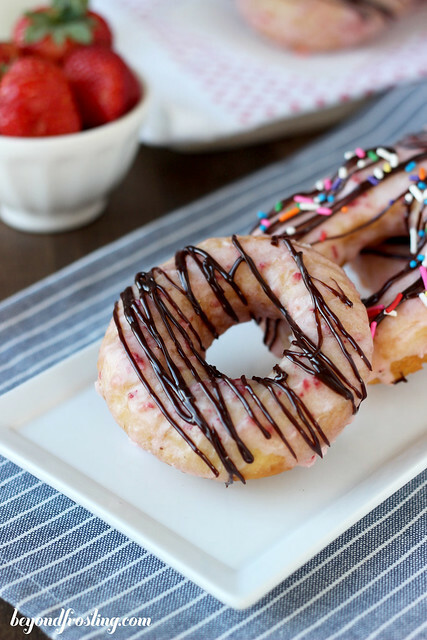 I made these donuts a couple times. The first batch I totally botched half the donuts. They were more like “discs” than donuts. Here is what went wrong. After the first rise, things were looking good. I rolled out the dough, cut the donuts and then laid them on a sheet pan for the second rise. After about 30 minutes on the counter, things seemed to be progressing slowly, so I put them in a warmed oven. Wha-Wha. The added heat on the second rise did a number to my dough. It created air bubbles and softened the dough to a point where it was no longer pliable. Refer to above photo. As soon as I picked them up, they would just wilt. So I threw them in the fryer anyway, and they didn’t do much. They fried up just fine, but they were so flat. Now the 2nd tray (which I left on the counter, rather than putting in the warm oven) seemed to be just fine. They just about doubled in size and had a little bit of height to them. This is how they should look! See the difference? So I made them all over again. Half a batch wasn’t acceptable for me. This time I left both trays on the counter and all was good again. 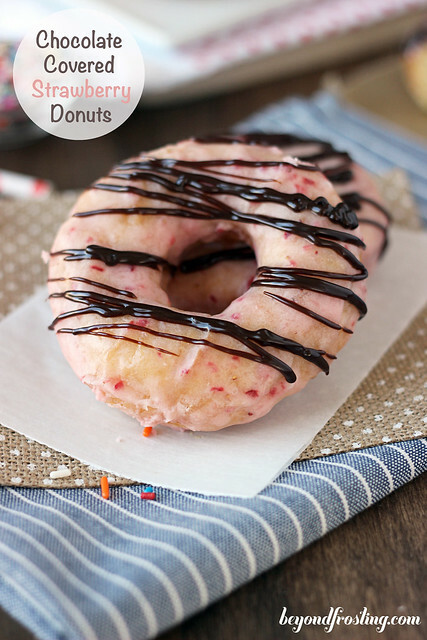 The recipe for these donuts is from King Arthur Flour Bakers Companion. This recipe calls for instant yeast. I am not familiar with the different varieties of yeast, so I had to Google it. I only had active dry yeast in my cupboard. Turns out you can use active dry yeast in place of instant yeast, you just need to skip the water. You dump the yeast right into the flour. 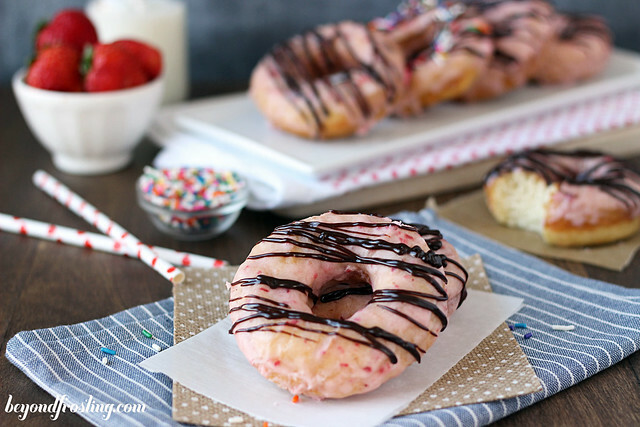 The rise time for these donuts isn’t too long, so you can start them early in the morning and be serving fresh, fried donuts for a late breakfast. Speaking of frying, don’t be scared. You need about 2 bottles of vegetable oil and a candy thermometer. You can pick up a cheap thermometer at Target or on Amazon. It really helps to know the temperature of your oil whenever you are deep frying. For these donuts, your oil should be between 345°F- 365°F. I found that I liked the donuts better when fried in the lower temperatures because they were lighter in color and didn’t overcook. To remove from oil, use a pair of metal tongs, tap off the excess oil and dry them on a wire rack. Wait for these to cool before you glaze them, otherwise it will melt right off. For the glaze, I used fresh pureed strawberries, powdered sugar and bit of milk. 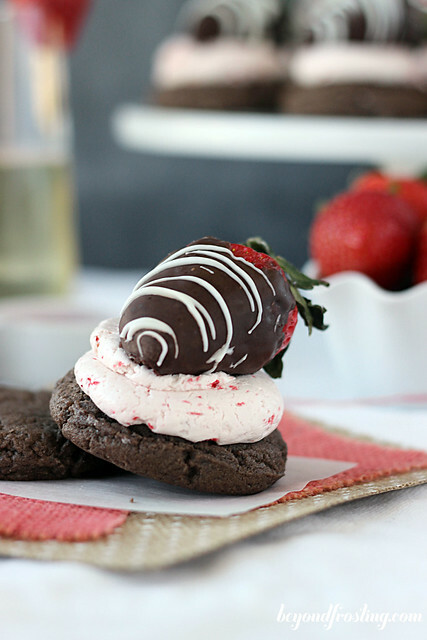 Since the strawberries are “wet”, you will need to add more powdered sugar to your glaze to thicken it. I also used a little bit of vanilla extract to cut the sweetness of the powdered sugar. I chose to dip my donuts in the glaze so I didn’t waste any. After the glaze hardened over slightly, I added the chocolate ganache. 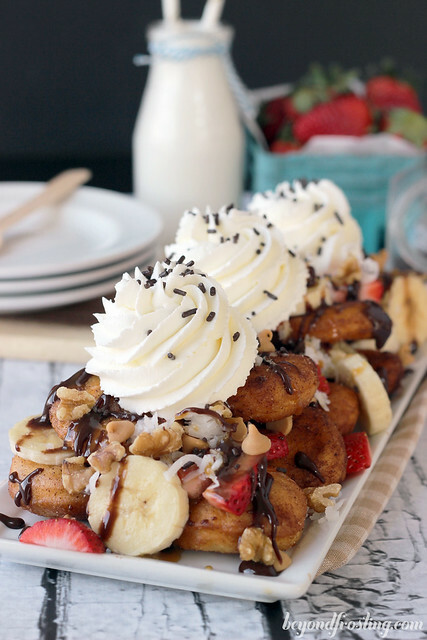 I love a good chocolate drizzle! 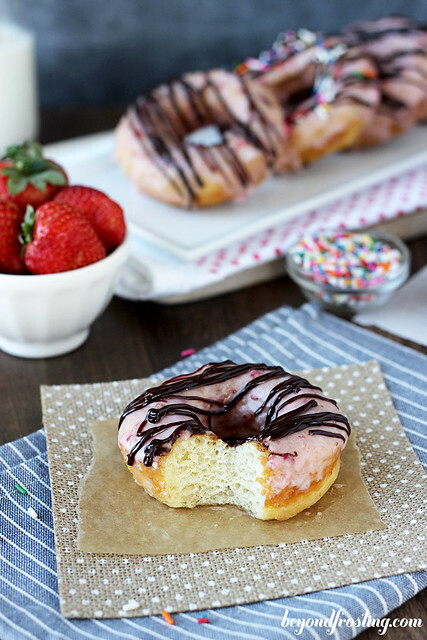 These donuts are best served the same day you make them. You can keep them overnight in an air tight container, but they are for sure not as good on the second day. These donuts are soft and very fluffy. They remind me of an old fashioned glazed donut. I am *kinda* proud to have stood up to the daunting task of homemade fried donuts, and I hope to bring you more variations in the future! In a large bowl, whisk together all dry ingredients: flour, salt, nutmeg and yeast. In a separate bowl, whisk egg and combine with milk, melted butter and vanilla extract. Slowly stir wet ingredients into dry ingredients and turn dry ingredients over with a wooden spoon, or your hands until a wet dough forms. Allow dough to rest for at least 5 minutes. Knead dough for 6-8 minutes either by hand or with a stand mixer until a soft dough forms. Knead on a lightly floured surface. You should be able to poke the dough and it springs back up. Place dough in a buttered bowl and flip it to coat both sides. 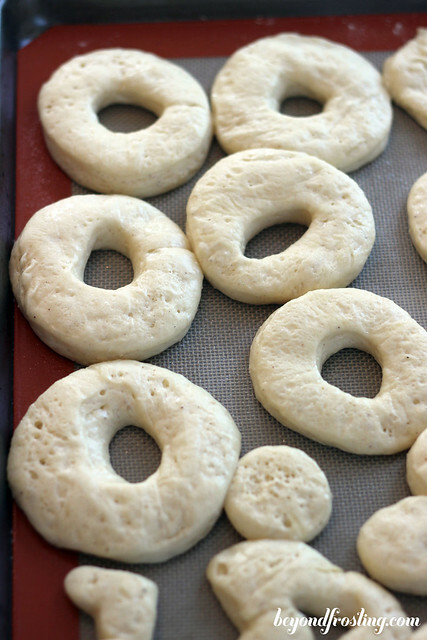 Cover with a towel and allow dough to rise in a warm location for 1 ½ for 2 hours until the dough doubles in size. Turn the dough out onto a lightly floured surface. 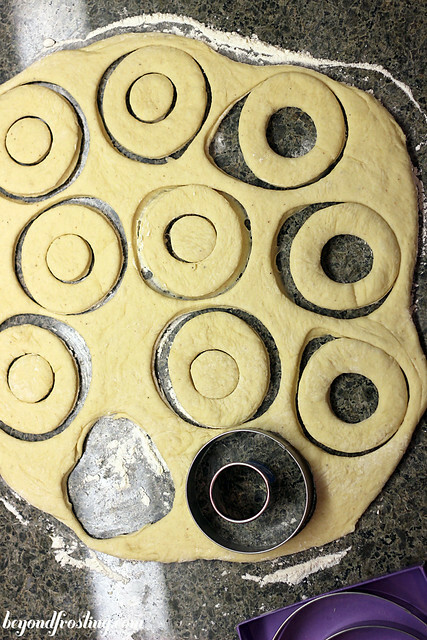 Roll dough out to 1/4” thick and cut with a round cookie or donut cutter. Heat oil to 345°F- 365°F. Place dough into oil and fry on each side for about 30 seconds until lightly golden brown. 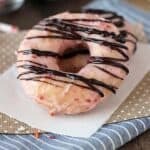 Use a pair of metal tongs to remove donuts from oil and gently tap off excess oil. Allow to cool on a wire rack. To prepare the glaze, wash and dry strawberries. Puree until smooth. Combine strawberries with powdered sugar, start with 2 cups and add additional powdered sugar until desired thickness. 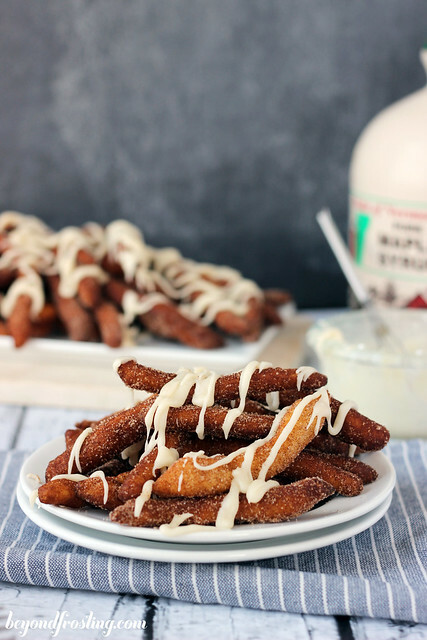 Add vanilla extract and milk to fit your taste buds. 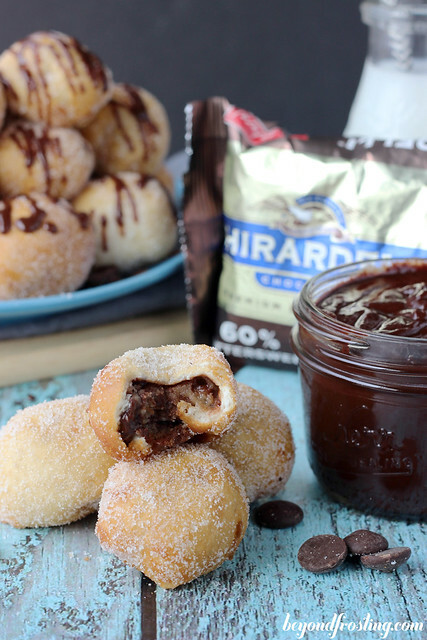 Dip donuts 2-3 times in the glaze. Flip over and allow the glaze to set for about 30 minutes. Cover with chocolate ganache. For the ganache, combine 8 oz chocolate chips with 3 tbsp heavy cream in a microwave-safe dish. Microwave on high for 30-60 seconds. Stir until chocolate is smooth. Add additional heavy cream to thin out ganache if needed. 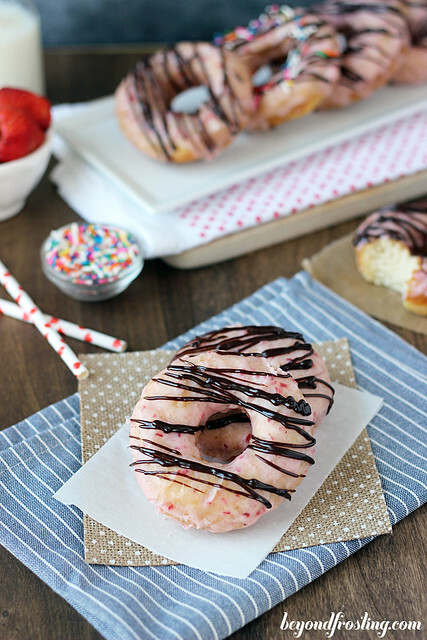 Drizzle over donuts. 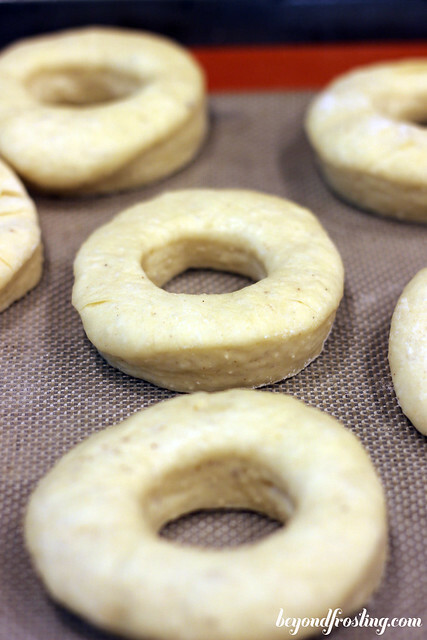 Recipe for Yeast-Raised Glazed Doughnuts from the King Arthur Flour Bakers Companion cookbook. More donuts from my friends!